Repainting the outside of a house is one of the most dramatic and cost effective ways to breathe new life into it. It can be used to improve the look of a home to encourage a sale and can make for an ideal DIY project. Within this guide, you will learn how to paint the external walls and any considerations that must be addressed. Details such as selecting the right equipment and best paint for exterior walls will also be addressed. In most cases you are free to select a colour and style to suit your personal tastes. But if your property is listed, within a conservation area or National Park, you will need to conform to regulations or seek prior permission. If you are not the freeholder you must ensure you have their permission to modify the property. Since you will be spending much of this job working at height you will need to have suitable safety measures in place. A scaffold tower or platform is the safest way and easier way to paint high areas. Taller buildings may require full scaffolding, in which case you will need to contact a trusted scaffolding company. Having the right equipment will allow you to tackle the job more effectively Don’t skimp here, this list contains the bare essentials to paint your house to a great standard. You may need to swap your roller for a wide brush if you have a rough pebbledash surface. Remember to wear comfortable, unrestrictive clothing that you don’t mind getting covered in paint! As with all painting jobs, the result is only as good as the preparation. Failure to prepare the surface will lead to a poor finish that will need redoing in no time. Before you can paint, the outside walls need to be clean and sturdy, with any repairs made before commencing. This job is best done during the clearest weather possible and is not to be rushed. Brush off the walls using a wire brush, removing growths, moss and any other loose materials and dirt etc. Mould can be removed using a water/bleach solution. If the wall still has existing paint ensure you remove all flaking. Repair cracks using fillers or render. A filling knife can be used to smooth the surface again. Layers can be applied to fill deeper penetrating cracks. Ensure filler is sanded back down to a smooth finish after drying. Allow the Surface to dry before attempting any painting or coatings. Mask up all windows, doors, pipes and anything else that won’t require painting. Apply a breathable stabilising primer to the walls. This prepares the porous wall material for paint application. It must be breathable to allow for moisture to escape from the wall. Which External House Paint Should I Be Using? The best exterior masonry paint is certainly not going to be the cheapest. The price of paint is varied It’s worth paying a little more for a quality paint that’s going to have greater longevity. Dulux Weathershied is an example of quality exterior wall paint and Sandtex specialises in masonry paint. Many colours are available but white and cream are the most common choices. Perhaps as they are least likely to clash with your neighbour’s! Textured paints are much easier to apply to smooth render, whereas smooth paints are best applied to rough pebbledash walls. Make sure you buy enough paint to complete the job in one go. Measure the area of your walls and the estimated coverage from your paint supplier. Get FREE Painting Quotes Today! Masking should be in place before beginning. You will need to cover doors, windows, pipe work and use ground sheets. Using pipes and windows as guides, divide the wall up into sections that can be completed in one go. Thus, you can minimise start/stop lines on the finished wall. Always begin at the top of a wall and work your way down to avoid running. You should use both vertical and horizontal strokes to apply the paint effectively. Load the brush with a generous amount of paint without causing spillage. Make sure the surface has been evenly covered, especially when painting rough surfaces. For rough surfaces you will need to stipple with the brush. Perform this by holding the brush at an angle and pushing the bristles/paint into the wall surface. Carefully cut around pipes, ensuring you effectively cover the areas behind. Repeat for number of coats recommended by paint manufacturer, allow for indicated drying times between coats. Dispose of waste materials and excess paint carefully; see local council guidelines for more information. Try to paint around by following the sun, this will allow the walls to dry off much quicker. How Much Does House Painting Cost To Have Done? Ask if they are using the best masonry paint for your type of wall. You can choose a PDA member to ensure you are working with trained professionals. The price for painting external walls will vary depending on the level of preparation the wall needs and the number of coats. Also pebbledash surfaces can be trickier and a little more costly. For an average DIY job it may cost around £500+ to paint your house. You need to calculate how many cans of paint you will need to cover your walls. Manufacturers typically advise 1 litre will cover 15 metres squared. Yet for pebbledash or new surfaces this can be halved. Masonry paint prices may be higher in B&Q than trade sources or even amazon UK. It certainly pays to shop around and find the best price for paint. As always, it’s advised to contact at least three and get quotes for the work. Rated People can help you find tradesmen. Then you can make an informed decision based on competitive pricing for your project. 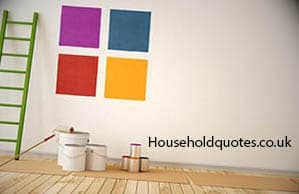 Get Your FREE Painting Quotes NOW!